With the wind and tongues of fire, the Day of Pentecost is upon us, as we experience the glorious climax of the Easter season. The lessons for today manifest the creative power and presence of the Holy Spirit both in the Church and in our individual lives. “It is to your advantage that I go away.” (John 16:7) These words must have greatly disturbed the disciples. They could not see any advantages in being separated from this one whom they loved. The “Advocate,” the Holy Spirit, who would not come unless Jesus went away, was only a vague notion to them. How could they imagine replacing the flesh-and-blood Jesus with something as nebulous as a spirit? So Jesus gave more concrete information about the work of the Holy Spirit in order to help the disciples grasp the reality of this Advocate who was to come. The Spirit convinces the world of sin (16:8). While the Spirit is the advocate/defense attorney for believers, the Spirit is the prosecuting attorney for unbelievers. This was a turnabout. The world has accused Jesus and his followers of sin. The Spirit rises to their defense by showing where the guilt really lies. The Spirit would convince the world of righteousness (16:8). The Spirit opens people’s minds to enable them to perceive that Jesus is the right, that his words are true. The Spirit convinces the world of judgment (16:8). Evil is unable to defeat Jesus, to keep him from the grave. As a result, the Spirit is able to persuade people that since Jesus is the victor, judgment on all that is not surrendered to him will be real. The Spirit guides the believers to know the truth about that is to come (16:13). This is not so much the ability to foresee the future as to be able to understand the meaning of events as they happen. What is it better to have the Spirit’s presence than to have Jesus’ physical presence? What things has the Spirit declared to the Church that Jesus could not tell the disciples then? Has the Holy Spirit dealt with you in any of the five ways listed above? Which one(s)? What was the result? 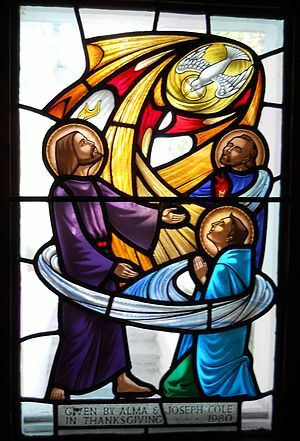 Try to imagine the scene as the wind and fire appeared to the disciples on Pentecost. What do you think is the significance of the fact that a tongue of fire rested on each of the individuals present? How do you think they might have felt at this time? What is the significance of this event for us today? In what ways do you feel the presence of the Holy Spirit in your own life, in the Church and in the world? This entry was posted in Feast Days, Pentecost and tagged Acts of the Apostles, Church, Holy Spirit, Jesus, Pentecost, Trinity Sunday. Bookmark the permalink.